Mt. Makiling, Philippines, 1959. The Tenth Jamboree. First World Jamboree in the Far East. 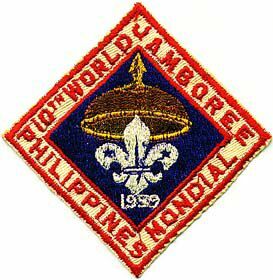 12.203 Scouts from 44 countries. "Building Tomorrow Today". Half a million visitors in one day. "The bamboo Jamboree" a nipa palm and bamboo city. The meeting of East and West, a revelation to both sides. The Filipino smile, unforgettable. In view of previous weather tantrums at other Jamborees, French Scouts, well prepared for all contingencies, marched past with a splash of yellow raincoats. The full story could never be told.....a World Jamboree is not really the Arena shows, the Campfires.......The real Jamboree takes place in the hearts of boys from many lands.